Legal proceedings continue in the contentious battle over sunken coin treasure as a Court of Appeals has granted a request for oral arguments at the behest of a salvage company. 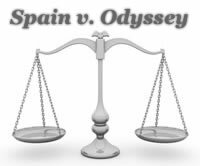 Odyssey Marine Exploration was recently notified that the United States Court of Appeals for the Eleventh Circuit would hear oral arguments on the case that is currently pending before it between Odyssey and the country of Spain. At issue is the ownership of over 500,000 Colonial-period silver coins that were recovered from the bottom of the ocean by Odyssey. Given a project name of "Black Swan" by Odyssey, the initial recovery took place in 2007 off the coast of Gibraltar and proved to be controversial almost immediately. Within weeks of 17-tons of coin treasure being sent to Florida by Odyssey, Spain seized vessels belonging to the company, forcing them to port in order to conduct searches to protect against a possible "offence against Spanish historic heritage." Furthering the matter, Spain filed claims in the United States contending that the treasure was from a Spanish ship known as the Nuestra Señora de las Mercedes which had sunk in Spanish waters, and therefore the property of Spain. Spain has since conceded that the shipwreck was not in Spanish waters, but still lays claim to its contents. Odyssey, however, affirms that even if the Black Swan treasure was from the Mercedes, which it says can not be confirmed as there no vessel and the findings were discovered directly on the sea floor, the ship was on a commercial voyage. It states that at the time of the sinking in 1804, the Mercedes was transporting private passengers, mail and other cargo rendering it a private vessel. As such, its commericial purpose legally voids Spain’s claim under settled international law and conventions. A magistrate’s decision in late 2009, adopted later by a district judge, found that the court lacked jurisdiction in the matter and moved to dismiss the case. The court believed the treasure to be from the Mercedes and concluded that it should be returned to Spain. Odyssey filed an appeal and asked for oral arguments to be allowed. The 11th Circuit has agreed to the oral arguments (which it does so only about 25% of the time) and has scheduled them for the week of February 28, 2011. "We are looking forward to presenting oral arguments in the ‘Black Swan‘ case to the appellate court. We believe the district court incorrectly dismissed the case based upon clearly erroneous factual findings and flawed legal analysis of basic admiralty principles and the concept of sovereign immunity," said Melinda MacConnel, Odyssey Vice President and General Counsel. "In addition, Odyssey and the other claimants in the case were denied their right to due process because the district court failed to conduct an evidentiary hearing on the disputed issues of fact." Appeals have also been filed by others who claim that if Spain’s assertion that the cargo is from the Mercedes is correct, then as descendants of those who originally booked the cargo, they also have legitimate property rights. Odyssey is clearly in the right. Spain knows this and their behavior from the beginning has been an embarrassment to their people. The coins were not found in Spanish waters, but found in International waters. The coins were found in the ocean floor not on a ship. There is no evidence the now gone ship was from Spain. If it was from Spain they would only be allowed 10% since the supposed ship was carrying non-government property! Spain should eat crow and try to save some face by letting this go.